I began by watching the various news channels on the television. Then I started to read the blogs, Twitter, some of the Main Street Media, and so on. The Notre Dame devastating fire has ripped through the hearts and minds of people all across the world. Thousands worship there annually. Thousands visit the Notre Dame Cathedral, annually, from all over the world, whether they are Catholic or many other religions. There are tears in their eyes, grief in their hearts, dismay in their minds, and total disbelief at such a disaster, and understandably so. It has been an important part of society for centuries, not only for Catholics, but others as well. However, getting back to the point in the title of this article, being "BECAUSE IT ACTUALLY SIGNIFIES THAT HUMAN BEINGS DO HAVE A PROBLEM OF THE MIND AND HEART IN RESPECT OF COMPARISONS AND BELIEFS". With the Notre Dame Cathedral it can be seen by all who want to see it. It is part of the daily or weekly life for many, but when something happens like the inferno that has destroyed a large part of the Cathedral, it hurts, they cry, they grieve, they walk around in disbelief. Understandably so. Now let's apply the same Human reactions to THE GLOBAL DEBT FACILITY. People don't grieve, or cry, or suffer from disbelief, even though The Global Debt Facility is possibly one of the most important factors applicable to every Human Being on this planet. It is there for every country and every person, but very few care, and certainly they don't grieve, cry, or have the disbelief as they do in respect of the Notre Dame Cathedral............................ WHY? The Global Debt Facility is NOT VISIBLE and it has been deliberately hidden under the pretext of being TOP SECRET, or, ABOVE TOP SECRET for decades by persons (Our Religious and Political Leaders both past and present) who have devious intentions to deny the World and its People access to same. Because it is NOT VISIBLE to the people, whereby they just ignore the subject. It doesn't matter to them, as much as the Notre Dame catastrophe. Then I continued to search and read on. Then I found some articles on the Alternative Media that made me think, or, made absolute sense. Wow, that's quite a statement, so are we looking at a possible False Flag Attack. 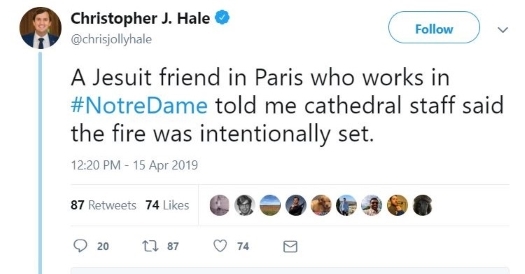 Only time will tell us whether the inferno at the Notre Dame Cathedral was arson (as a cover up of something else by unknown forces) or whether it was accidental due to some electrical failure or similar. I will therefore not continue on this subject until more is known. Within the first introductory paragraph were the comments "PROBABLY THE MOST IMPORTANT THING I'VE EVER WRITTEN PLEASE READ ALL TO THE END", so I did continue to read it right to the end because it held a lot of meaning and with very constructive and definitive factors / issues. I will not copy and paste this because it is quite long, so it is better for people to go to the link above and read it for themselves, at their leisure. Whatever, the principles are what are applicable in respect of THE GLOBAL DEBT FACILITY. People have not been told the truth because you are not supposed to know about it. It has been deliberately hidden for decades by persons (Our Religious and Political Leaders both past and present) who have devious intentions to deny the World and its People access to same. Then we all wonder why the World is in such a mess. The GLOBAL DEBT FACILITY is also fundamental and important to the people of this planet as the Notre Dame Cathedral is to people Paris, France, and many other countries around the world, but very few know about it because they do not see it within the daily / weekly lives. It's NOT VISIBLE to them, even though it is real and is there. It is there for a purpose, an important purpose if only people realise that factor. Had The Global Settlements Agreement been implemented in full, back in the 1980's, this planet would not be experiencing the problems it has experienced in the last few decades. Increase in the number of homeless, right across the world. Mass immigration from places like North and North West Africa and the Middle East. That is just to name a few. What I have tried to signify within this article is how imbalanced the world is, and what is wrong within the minds and hearts of Humans. It hurts us when we can see it and it is VISIBLE, but when it is NOT VISIBLE we ignore it at our own peril. 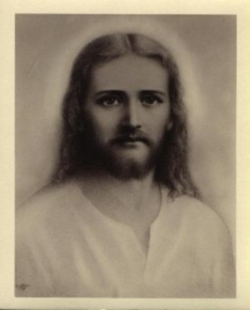 The subject of the GLOBAL DEBT FACILITY is not taught in any College or University anywhere in the World, even though it is a highly important historic issue to every person of this World, to the World's economy, and to the welfare of the people of this planet, Just as God, Jesus, Allah, Mohammed, and others are important. BUT, BUT, BUT, totally ignored, especially by those elite who we all vote into power to manage and administer our country, no matter what country it is. It really does appear that the minds of people are manipulated and controlled by those elite (Past and Present) who deliberately teach us false narratives; and who we all vote into power to manage and administer our country, no matter what country it is. Think about it all after you have read the articles mentioned above. It might just open your mind to reality. DAVID CRAYFORD ------- WHY IS IT THAT PEOPLE ACROSS THE WORLD ARE SO NAIVE, STUPID, AND WHOSE MINDS ARE SO BLINKED UPON A SPECIFIC FALSE NARRATIVE THAT NEVER SEEMS TO CHANGE …………..
DAVID CRAYFORD ………. HERE WE GO AGAIN WITH YET ANOTHER CRIMINAL AND UNLAWFUL ATTEMPT TO STEAL ASSETS OF THE GLOBAL DEBT FACILITY ……………..
DAVID CRAYFORD ……… THE AMERICAN GOVERNMENT, ITS PAST AND PRESENT UNLAWFUL ACTIVITIES AGAINST THE WORLD, ITS PEOPLE, AND THE GLOBAL DEBT FACILITY……. David Answers a Letter written to HIM at my email..